It’s time to do it all over again and this time do it better. 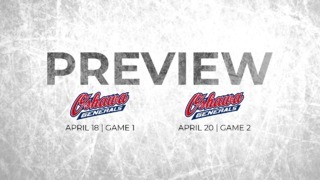 The Ottawa 67’s head into the second game of their playoff battle against the Hamilton Bulldogs on Sunday, eager to put on another fighting display on the road and this time emerge victorious. 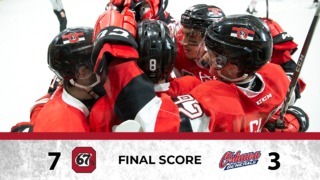 The score line of the first game might read 6-3 in favour of the Bulldogs but it was a game in which the 67’s fought hard against the Eastern Conference champions. The Barber Poles showcased their ability to fight back, which has been the highlight of their games during the regular season. Twice they came from a goal down to level the score and were trailing only a goal at the end of the second period but couldn’t produce another of their characteristic third-period surges. Despite that, the 67’s will take a lot of positives from the first game and will go into the second game believing that they can pull off a win. A look at the statistics of the first game reveal how close the battle was. The 67’s had 23 shots on goal, compared to 28 for their opponents. They won more face-offs than the Bulldogs – OTT 34 vs HAM 28. Olivier Tremblay pulled off 19 saves for the 67’s, 10 of them coming in the second period during which Hamilton turned it on with 13 shots on goal. In the third period the 67’s had more shots on goal (OTT 9 vs HAM 5) but couldn’t covert them. Noel Hoefenmayer delivered a standout performance for the 67’s, scoring two goals and adding one assist. He scored a cracker in the second period, from just inside the blue line, to make it 2-2. Sasha Chmelevski too was in the mix with two assists in the game. Coach André Tourigny’s boys have put on a strong display in the first game but will be looking to tie up the loose ends. 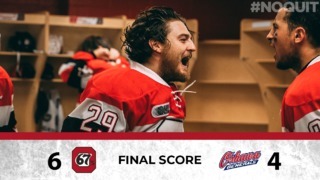 With Games 3 and 4 at home on the horizon, a win in this one will give the 67’s a huge boost in momentum when they arrive back to TD Place.